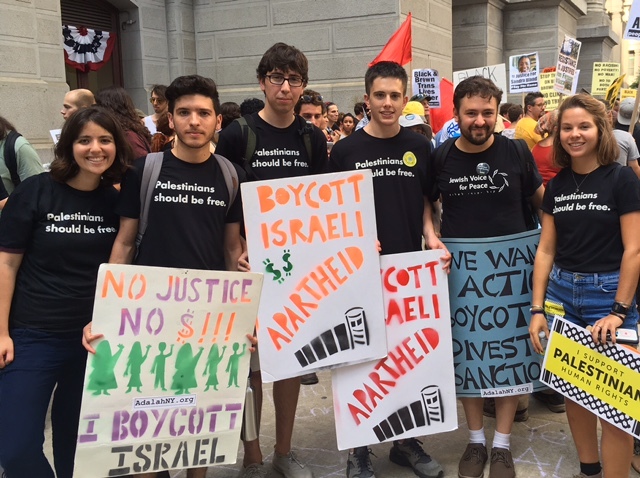 Last week, I spent two days walking around downtown Philadelphia outside the Democratic National Convention wearing a t-shirt that said “Palestinians should be free.” It’s a direct, universal statement, but somehow, it’s surprisingly controversial. While core values of justice, dignity, and human well-being have pushed issues like livable wages, affordable education, and ending mass incarceration into the spotlight this election cycle, these values aren’t limited to inside our borders. They’re the same values that lead us to demand better on the issue of Palestine. Palestinians, and all people, deserve to have their human and civil rights respected, and to live with justice in peace. This year, both the Democratic and the Republican parties seem to have rejected that message. Both party platforms commit to continuing support for an oppressive Israeli regime, giving what amounts to a free pass to an occupation that enacts systemic violence and daily dehumanization against Palestinian people. The Democrats say they’ve adopted “the most progressive platform in party history,” but on Palestine and other issues they fell short: the platform fails to even name the occupation. Meanwhile, the Republican platform excludes support for a two-state solution entirely. Determined to hold our elected leadership accountable, I joined four other JVP summer fellows from across the East Coast on Tuesday. We aimed to bring the message that Palestinian rights are a progressive issue to Philadelphia during the Democratic National Convention. Last week, Philadelphia saw a lot of protests. From Black Lives Matter to Bernie Or Bust, demonstrators represented a wide range of issues, both in and outside the convention hall. Add to the mix the fact that the convention’s speakers included current and former presidents, as well as elected leaders at the local, state, and national level, not to mention the presence of delegates from every state representing millions of primary votes cast– that’s a lot of democracy in one place. Which can be a bit intimidating. But our voices weren’t drowned out. On the contrary: with other members of JVP, both from the national organization and from local chapters, we joined protests on Tuesday and Wednesday, to educate on our issue and amplify our message. I talked to other demonstrators, delegates, passers-by, and convention volunteers: people who, at least by the range of the buttons, t-shirts, and hats I saw, seemed to have different views on what should happen in this election. We talked about the occupation in Palestine, and the need for the Democratic party to represent its constituents, who are increasingly supportive of Palestinian rights and freedom. We talked about BDS as a nonviolent tactic, and the unique obligation Americans have as citizens of a country that sends Israel so much money in military aid. For the most part, people were interested. Another millenial in a Hillary ‘16 snapback told me, “I consider myself a true progressive. But I really don’t know anything about this issue.” We talked about increasing Israeli settlements on Palestinian land, and the way the Israeli government cuts off Palestinian access to electricity and water, about Israel’s basic violations of human rights and international law. “I think you’ve convinced me,” he said. “I’m going to go learn more now, but I think you’ve convinced me.” Later, an older Bernie Sanders delegate told me how disappointed she was at New York pushing through anti-BDS legislation through executive order. I told her about some of JVP’s efforts this summer to fight that, too. The people I talked to were interested that I was young, that I’m Jewish, and also, in what I had to say. I was surprised by how many people- on the street, and inside the nice hotels we briefly managed to enter- told us they supported us. That our message was their message. Perhaps I shouldn’t have been surprised. New polling released by the Arab American Institute shows that 65% of Americans believe Palestinians and Israelis deserve equal rights, and pluralities in both parties think the United States sends too much military aid to Israel. More polling shows that key demographic groups that make up the Democratic party’s coalition– women, young people, and people of color– are expressing more and more sympathy with Palestinian people, and view Israel’s actions as unjustified. I think it’s true that trends are changing. It’s heartening to see that reflected not just in poll numbers, but in the engagement, the passion, and the interest of so many people in Philadelphia last week. Lena Shapiro is originally from Washington, D.C., and is now a rising senior Wellesley College, where she studies political science and political theory. She is working as a JVP fellow this summer.